"The subject of this painting is one that needs no explanation, - the welcome arrival of the tired traveler at his inn and the eagerness with which he stumbles up the steps towards supper and lodging. 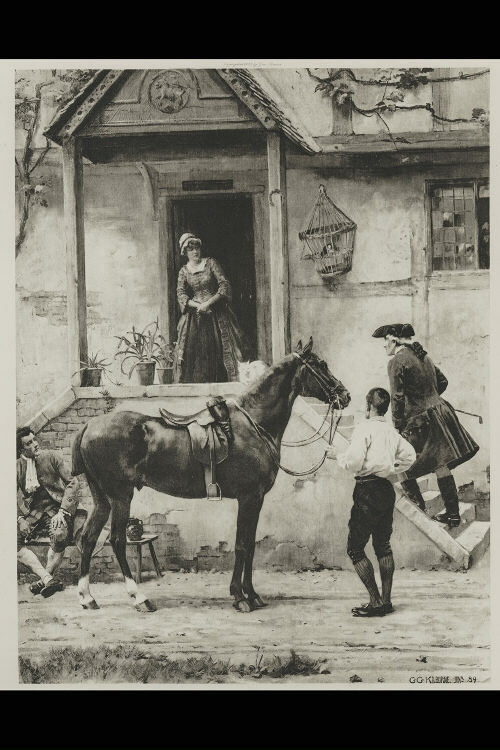 It might be said, however, that his welcome is not very demonstrative, the landlady leans against the door frame and watches him ascend without making any friendly demonstrations, the hostler seems quite undecided as to what to do with the horse, and the idler with pipe and mug on the bench regards the newcomer quite without joy. This picture is not much larger than the photogravure plate, carefull painted, and apparently in oil, though it is put down in all the cataloques as a water color. Mr. Kilburne, who has another work in these galleries, is a frequent exhibitor at the Royal Academy, and his favorite subjects are the decorous, well arranged genre compositions."